Every year at Shawnee High School, the Renegades hold the Crystal Apple Awards to celebrate the school’s teaching staff. This year was no different. On March 10, 2017, selected members of the Shawnee faculty were honored with the coveted Crystal Apple. “The Crystal Apples are in conjunction with another award given out by the school, the People’s Choice Award. The school holds these programs in order to celebrate its outstanding students and teachers who have positive impacts on the school and community,” said Shawnee principal Matthew Campbell. For the Crystal Apple Awards, Shawnee’s administration asks students to nominate a teacher that they feel has made a positive impact in their lives or has inspired them in some way. Students write an essay about the teacher of their choice, detailing how that teacher has impacted their lives. A special committee then selects the winning essays from the ones submitted. The students’ essays vary in length, with some essays being simply one paragraph while others take up one or more complete pages. The theme for the essays changes every year to tie the awards in with Shawnee’s “One Book, One School” summer reading program. This year, the theme for the essays had to do with The Good Thief by Hannah Tinti. Essay submissions open to students before winter break. On the afternoon of the awards, students and teachers gather in Shawnee High School’s auditorium. The winning teachers are announced along with the student who nominated the teacher and wrote the winning essay. The student then stands onstage and reads the essay that he or she wrote as the winning teacher stands alongside them. It is a very emotional display as the winning teachers learn just how much they mean to the students that they teach. It is one of the highest honors that a teacher can receive at the school. Ms. Rebecca Amy, one of this year’s winning teachers, was particularly honored to have won an award. When asked how she felt being the one honored with an award out of all the teachers nominated, Amy said she felt humbled. “I know many teachers who are deserving of this award,” stated Amy. Shawnee student Hailey Wilmot wrote the winning essay that nominated Rebecca Amy for the award. Shawnee junior Joey D’Intino, who wrote one of the winning essays that nominated Dr. Meghan Jones, said that he decided to write an essay because he wanted to do something for a teacher that would mean a lot to him or her. 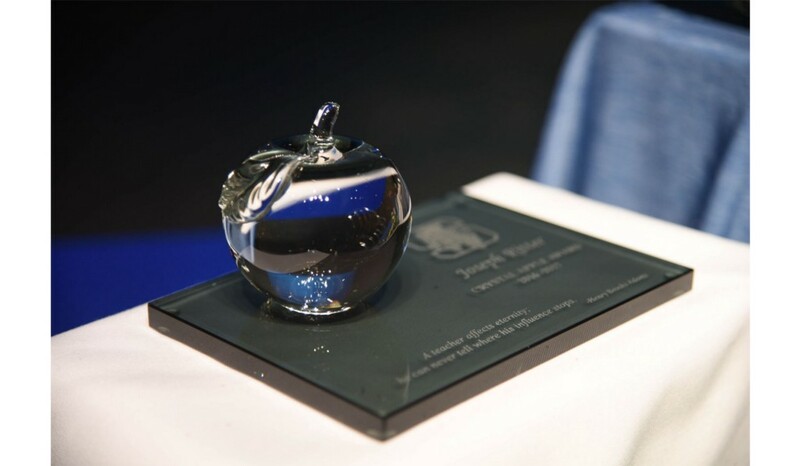 In total, 21 teachers won a Crystal Apple this year, with nine first-time winners receiving a leaded crystal apple trophy with a certificate and 12 second-time winners, who receive a certificate. This year’s first-timers were Rebecca Amy, Melissa Badin, Christina Boehmke, Mike Casey, Gina Kehl, Phil Langan, Joe Ritter, Janet Takemoto and Dr. Meghan Jones. The list of second-time winners included James Baker, Ray Castor, Ryan Franks, Gary Hill, Liz Hower, Rob Joubert, Judy McCue, Angela Miller, Marc Rohm, Nick Rotindo, Michael Spera and Melissa Valloreo. The Shawnee students that wrote the winning essays were Haily Wilmot, Nicholas Hall, Caitlyn Kresky, Meghan McMullen, Joey D’Intino, Andrew Ozazewski, Marianne Rotyliano, Maryanne Gibson, Nicholas Raimondo, Colleen Tuohey, William Donnelly, Sophia Fennimore, Vito Tafaro, Aaron Caldwell, Brianna Hartman, Sebastiano Lombardo, Josh Atwater, Mairi Scholefield, Grace Gibson, Paul Downey, Connor Valentino, Galen Ekimov and Jhanessa Bell.